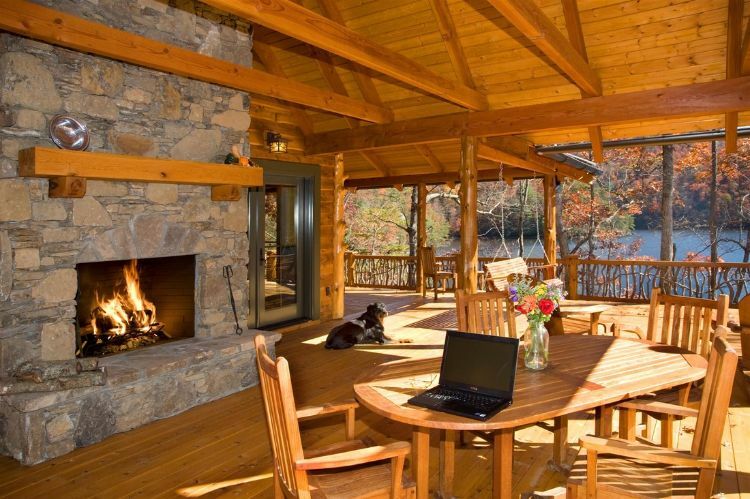 Whether you trek to this cabin for a week of fishing or to simply enjoy the nature around you, we guarantee you're not going to want to leave. The home isn't just surrounded by pristine forest that's lush and green in the spring and saturated in golds, reds and oranges in fall; it's also built beautifully. The cabin boasts a giant wraparound porch that's enclosed and outfitted with a fireplace, and it takes full advantage of the sweeping views. The inside of the home is decked out in modern furnishings and amenities that look like they're straight from a rustic Restoration Hardware. There's plenty of space for entertaining, as well as many corners to curl up in with a blanket and a good book. 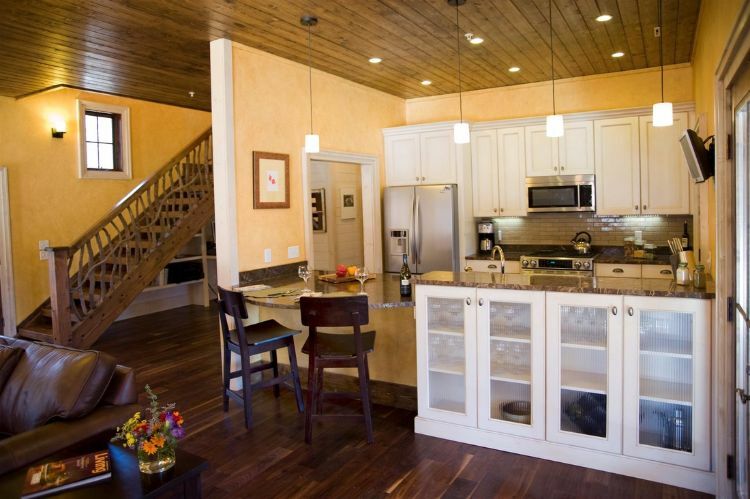 Take the tour and explore this property for yourself. Before you even step inside, you realize this home is extraordinary and luxurious. The porch is constructed in stunning golden timbers and accented with a unique railing and giant fireplace to nestle up next to on chilly nights. 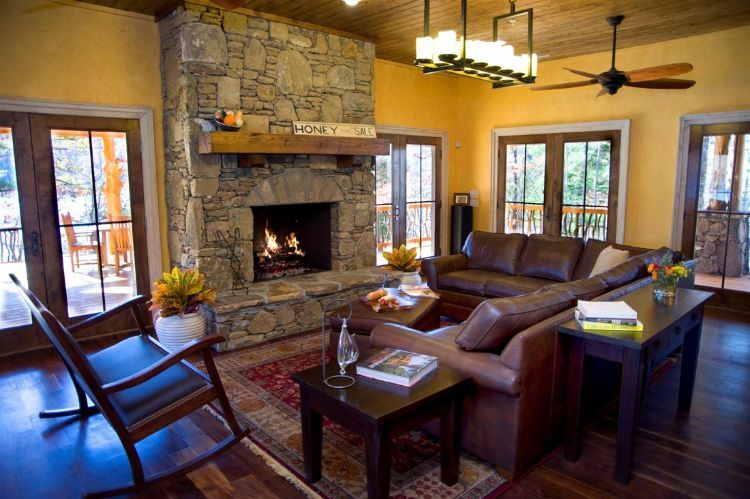 You could sit here all day warming by the fire and relishing those views, and we wouldn't blame you. Eventually though, you'll head inside. The living room shares the same stone fireplace, and it's furnished with an oversized leather couch — perfect for curling up with a good book. The attention to detail is incredible, from the dark wood floors to the plank ceiling and faux candle chandelier that adds more rustic flair to this space. The crisp white kitchen cabinets pop against the rich floors, stone counters and warm yellow walls. It's the perfect space to cook your favorite meal and still stay connected with your family and guests in the living space. The attention to detail continues — even to the foyer. 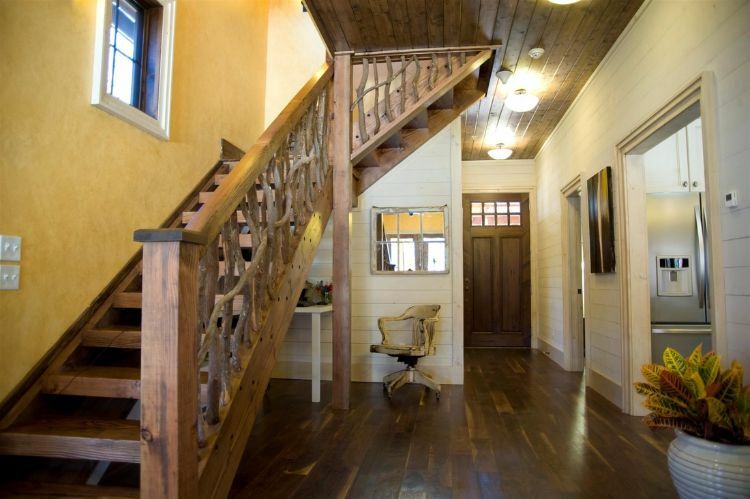 The stairs are a wonderful knotty wood, and the poles in the banister are twisting branches. Finally, the master suite: It's decked out with an entire wall of windows so you can wake up to the sun peering through the treetops and your very own private view of the lake. The design of the room is rustic, refined and beautiful. 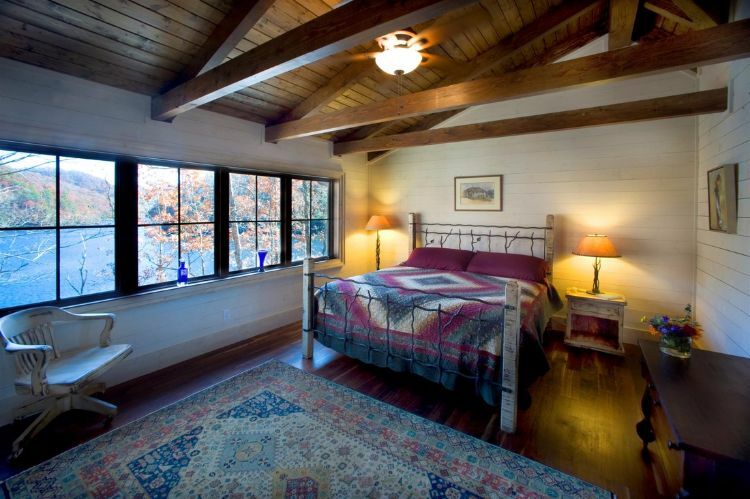 We adore the sloped ceiling and beams, as well as the wooden bed. 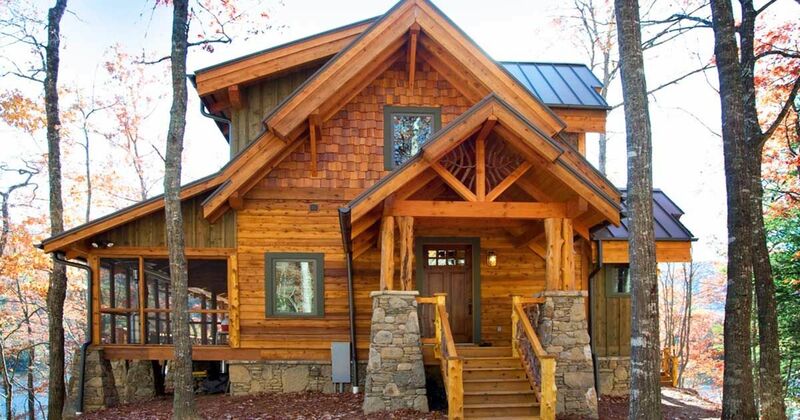 Already packing your bags for a long weekend away in this stunning Georgia cabin? Share it with someone you'd love to take along with you on Facebook, Twitter and Pinterest.